Here's a shot of my nearly completed R5C project. 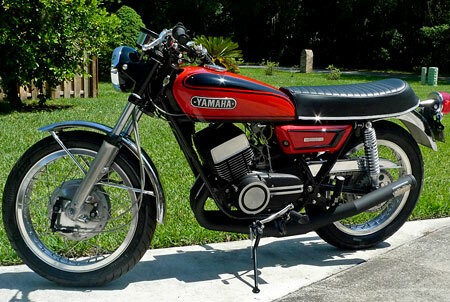 It started as a barn find that I picked up in the 2009 Bike Week auction at Deland for $400. It looked pretty complete and usable, the motor turned over and it appeared to be an easy restoration. Of course it wasn't. From the wooden seat base down to the decent looking, but rotten exhaust, every surprise was a bad one. The chrome wheels looked really good, removing the tires revealed they were unusable due to internal corrosion. And so it went. Surprisingly the motor was good, though the carburetors seemed to contain a hodge-podge of DS7/R5 parts. I stripped it to a bare frame, powder coated that and began the build from there. I was looking for a rest-rod look, identifiable as an R5 but individualized. The wheels are built up from a pair of XS650 alloy rims with Buchanans stainless spokes. The engine is stock with a K&N filter relacing the air box, jetting and a set of silenced chambers. I also added a n electronic ignition system.The side covers were refinished with an "asphalt" powder coat finish. Forks were rebuilt, new shocks, sprockets and chain installed, bearings repacked and all the usual maintenance and preparation were done during the build. The rusty turn signals were removed, the burnt out headlight bulb replaced with a (pricey) new one along with a new rim. The wiring loom was taken apart and remade. Handlebars are a Triumph pattern, narrowed about 2". I sourced a repro seat cover and found a better chain guard. I replaced as many fasteners as possible with stainless steel and fabbed up some others, like clevis pins. Some rusty chrome parts like the headlight bucket, taillight mount and brake linkages were powder coated. As you can see, the paint pattern is stock but the colors are not. It is Porsche Guards Red and Black. I thought the original tangerine was dated and I recalled how good some 70's bikes looked in red/black (Kawi Z900, Sportster, etc.). In keeping with the black rather than chrome theme, I changed the side covers to red with black spears and did the "350" with a black inlay. I'm very happy with the new look. 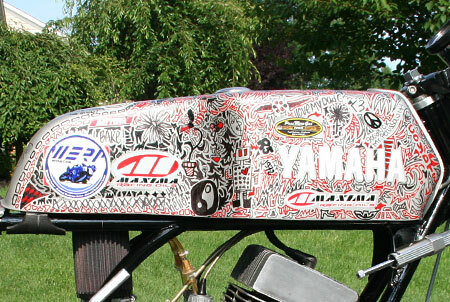 I'd hoped to finish it by Bike Week 2010, but as happens the project took longer than expected. I'd only just finished it, but not yet solved the carburation issue, when I had a serious accident on another bike. I'm literally just now getting back on my feet, so I have yet to ride it. But I will, and very soon! The bike looks great - can't wait to see it when it's finished! See more projects going on at MOTOEURO. 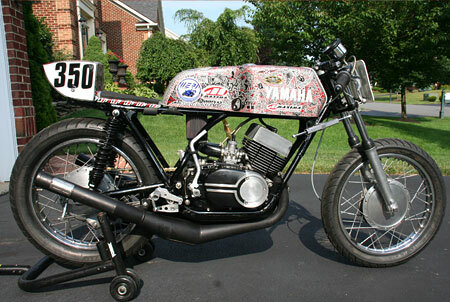 Love your web site and was very useful when I got started restoring & building up my WERA Vintage 2 class R5 racer. See photo attached and feel free to publish. She is a sweetie. Thanks for sending that in, Michel!